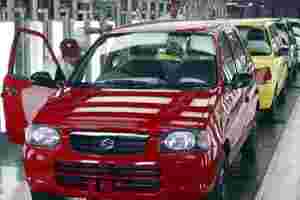 New Delhi: Maruti Suzuki, India’s top carmaker, reported a more than halving of its quarterly net profit, wider than industry estimates, hit by labour unrest at one of its key plants and rising interest rates in Asia’s third-largest economy. Maruti, which produced every second new passenger vehicle sold in India last September, accounted for only 40% of sales last month, according to data from the company and industry body the Society of Indian Automobile Manufacturers (Siam). “The economic slowdown does not augur well for the automobile sector as such and demand is unlikely to rebound any time soon," said Jagannadham Thunuguntla, head of research at SMC Global Securities. “Maruti will take quite some time to recover lost market share because the rivals have become very aggressive and are looking to tap the opportunity," he said. Maruti, 54.2% owned by Japan’s Suzuki Motor Corp , said last week it had resolved the labour unrest at its plant in north India that started in June and had crippled production and undermined sales. Bhargava said the unrest led to a production loss of 83,000 cars, a shortfall equivalent to around $500 million. The labour unrest hit the company at a time when the sector was battling a sharp decline in demand due to surging interest rates and rising fuel and vehicle costs, with many first-time buyers choosing motorcycles or scooters. Car sales in India fell in July in their first monthly decline in nearly three years. They continued to slide in August and September after a 30% jump last business year. India’s auto industry body this month slashed its growth forecast to 2-4% for this fiscal year that ends in March 2012, down from 12-14% estimated previously. “The market has been declining," Maruti chairman R.C. Bhargava told reporters. “We were more hurt than anybody else because we have a large position in small cars, where most of the buyers are very marginal." He hoped that the company would reach sales levels similar to the year ago period in second half of this fiscal year. The Reserve Bank of India has raised interest rates 13 times since early last year in an effort to battle stubbornly high inflation, a move that has hurt credit-based purchases and slowed economic growth. Car sales in the country are driven by a burgeoning middle class that mostly relies on bank loans for purchases, and about three quarters of new cars are financed by banks and financial institutions. Bhargava said Maruti was in advanced talks with Italian automaker Fiat to source diesel engines and expected the deal to be closed within two months. Maruti’s board on Saturday approved purchase of land by the automaker in Gujarat for “future expansion of manufacturing facilities", a company statement said, without giving details. Bhargava told Reuters last month the company would invest nearly $1.3 billion to set up a new plant likely in Gujarat. On Saturday, he said the proposed plant would help boost exports due to its proximity to a port. Maruti said net profit in its fiscal second quarter that ended on 30 September dropped to Rs240 crore ($49 million) from Rs598 crore reported in the same period a year earlier. Net sales in the quarter fell 15.7% to Rs7,540 crore, as total vehicle sales decling 19.6% to 252,307. A Reuters poll of brokerages had expected Maruti to post a net profit of Rs406 crore on revenue of Rs7,540 crore. The company said its operating margin in the quarter was at 3% compared to 8.1% in the year ago period, hit by lower sales volume and adverse foreign exchange rates. Shares in Maruti, which has a market value of $6.6 billion, have fallen nearly 21% this year, in line with a fall in rival Tata Motors shares but more than a 13% drop in the Mumbai market.